The alphabetical list below contains the names of corporate trade groups that are known to be, or have been, American Legislative Exchange Council (ALEC) members or supporters. Find other special interest groups here. Find ALEC law and lobbying firms here. Find corporations that have cut ties to ALEC here. You can add to these lists if you cite your source. The trade groups known to be currently involved with ALEC, as of September 2013, appear in BOLD. This is a partial list. You can add to it, if you cite your source. Alliance for Responsible Consumer Legal, Private Sector Member registered for the 2017 Annual Meeting. Alliance of Automobile Manufacturers, Private Sector Member registered for the 2017 Annual Meeting. Alliance of Health Care Sharing Ministries, Private Sector Member registered for the 2017 Annual Meeting. American Bail Coalition, Private Enterprise Board member and "Chairman" level sponsor of the 2014 ALEC Annual Conference. American Chemistry Council, "Director" level sponsor of ALEC's 2011 "States & Nation Policy Summit," member of ALEC's Energy, Environment and Agriculture Task Force Private Sector Member registered for the 2017 Annual Meeting. American Dental Association, Private Sector Member registered for the 2017 Annual Meeting. American Fuel and Petrochemical Manufacturers, Private Sector Member registered for the 2017 Annual Meeting. American Gas Association, Private Sector Member registered for the 2017 Annual Meeting. American Insurance Association, sponsor of the 2012 States & Nation Policy Summit in Washington, DC. Amusement and Music Operators Association ("a diverse group of companies engaged in the coin-operated amusement industry"
Associated Builders and Contractors (representing merit shop contractors, subcontractors, material suppliers and related firms), member of ALEC's Commerce, Insurance and Economic Development Task Force until it terminated its membership on January 24, 2013, according to an ALEC document. See Corporations that Have Cut Ties to ALEC for more. Association of American Physicians and Surgeons ("founded in 1943 to guard against the intrusion of government into the practice of medicine") Private Sector Member registered for the 2017 Annual Meeting. Automotive Trade Association Executives, Private Sector Member registered for the 2017 Annual Meeting. Chemical Manufacturers Association (now American Chemistry Council), "Director" level sponsor of ALEC's 2011 "States & Nation Policy Summit"
Cigar Association of America, Inc., “Chairman” level sponsor of the 2013 ALEC summer meeting ($50,000), host committee for the 2013 ALEC summer meeting, and “Chairman” level sponsor of the 2013 ALEC Annual Conference ($50,000). Colorado Apartment Association (CAA), Private Sector Member registered for the 2017 Annual Meeting. Consumer Technology Association, Private Sector Member registered for the 2017 Annual Meeting. Credit Union National Association, Private Sector Member registered for the 2017 Annual Meeting. CropLife America (formerly the American Crop Protection Association), ALEC Energy, Environment and Agriculture Task Force Member "Agriculture Subcommittee" Private Sector Member registered for the 2017 Annual Meeting. CTIA (Cellular Telecommunications and Internet Association), Private Sector Member registered for the 2017 Annual Meeting. Distilled Spirits Council of the U.S. (DISCUS) Private Sector Member registered for the 2017 Annual Meeting. Edison Electric Institute, Exhibitor at ALEC's 2011 Annual Conference, sponsor of the 2012 States & Nation Policy Summit in Washington, DC, and sponsor for the ALEC Energy, Environment and Agriculture Task Force reception at the 2013 ALEC summer meeting. Private Sector Member registered for the 2017 Annual Meeting. Entertainment Software Association, ALEC Telecommunications and Information Technology Task Force member, Member of ALEC Utah Host Committee for 2012 annual meeting. Private Sector Member registered for the 2017 Annual Meeting. Illinois Chamber of Commerce, “Trustee” level sponsor of the 2013 ALEC summer meeting ($5,000), and “Trustee” level sponsor of the 2013 ALEC Annual Conference ($5,000). Illinois Credit Union League, “Trustee” level sponsor of the 2013 ALEC summer meeting ($5,000), and “Trustee” level sponsor of the 2013 ALEC Annual Conference ($5,000). Illinois Energy Association, sponsor for the ALEC Energy, Environment and Agriculture Task Force reception at the 2013 ALEC summer meeting. National Automobile Dealers Association, Private Sector Member registered for the 2017 Annual Meeting. National Beer Wholesalers Association Private Sector Member registered for the 2017 Annual Meeting. National Federation of Independent Business, State corporate co-chair of Alabama, recipient in August 2011 of ALEC's Private Sector Member of the Year Award and speaker-- via its Manager of Legislative Affairs, Kevin Kuhlman-- on "Health Insurance Exchanges: States in Charge!" at ALEC's 2011 Annual Meeting Private Sector Member registered for the 2017 Annual Meeting. National Rural Electric Cooperative Association sponsored the 2012 States & Nation Policy Meeting in Washington, DC. NCTA - The Internet and Television Association, Private Sector Member registered for the 2017 Annual Meeting. NetChoice ("coalition of trade associations, eCommerce businesses, and online consumers"), "Director" level sponsor of 2011 ALEC Annual Conference ($10,000 in 2010) and "Chairman" level sponsor at the 2014 ALEC Annual Conference. Executive Director Steve DelBianco also spoke on the "Exploring ALEC positions on E-commerce and E-taxes" panel at the 2011 ALEC Annual Meeting in New Orleans. Private Sector Member registered for the 2017 Annual Meeting. NRECA, Private Sector Member registered for the 2017 Annual Meeting. Performance Marketing Association (represents the performance and affiliate marketing industry) - Executive Director Rebecca Madigan spoke on the "Exploring ALEC positions on E-commerce and E-taxes" panel at the 2011 ALEC Annual Meeting in New Orleans. Pharmaceutical Care Management Association, Private Sector Member registered for the 2017 Annual Meeting. PhRMA, ALEC Private Enterprise Board member, International Relations Task Force member, 2011 recipient of ALEC's Private Sector Member of the Year Award, "Chairman" level sponsor of 2011 ALEC Annual Conference ($50,000 in 2010), Louisiana Host Committee member sponsor of Louisiana Governor Bobby Jindal's plenary luncheon speech as well as a speech by PhRMA President and CEO John Castellani, “Chairman” level sponsor of the 2012 ALEC Annual Meeting, "Vice Chairman" level sponsor of the 2013 ALEC Annual Conference ($25,000). 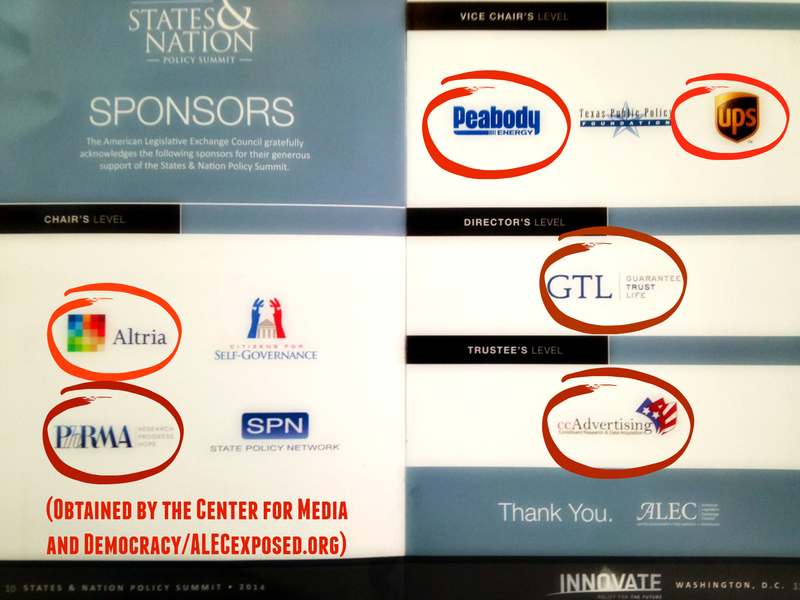 "Chairman" level sponsor at the 2014 ALEC Annual Conference, and "Chairman" level sponsor of ALEC's 2014 States and Nation Policy Summit. Property Casualty Insurers of America, ALEC Civil Justice Task Force member Private Sector Member registered for the 2017 Annual Meeting. Solar Energy Inustry Association (SEIA), member of ALEC's Energy, Environment and Agriculture Task Force, but according to an ALEC document, terminated its membership on January 14, 2013, "because their bill did not pass the task force." See Corporations that Have Cut Ties to ALEC for more. U.S. Chamber of Commerce, ALEC Education Task Force member, and "Chairman" level sponsor of the 2013 ALEC Annual Conference. Private Sector Member registered for the 2017 Annual Meeting. U.S. Chamber of Commerce Campaign for Free Enterprise, member of ALEC's Education Task Force until it terminated its membership on April 22, 2013, according to an ALEC document. See Corporations that Have Cut Ties to ALEC for more. U.S. Chamber of Commerce Institute for Legal Reform, ALEC Civil Justice Task Force member, “Chairman” level sponsor of the 2013 ALEC summer meeting ($50,000), and host committee for the 2013 ALEC summer meeting. US Justice Action Network, Private Sector Member registered for the 2017 Annual Meeting. Vinyl Institute, Private Sector Member registered for the 2017 Annual Meeting. Virginia Beer Wholesalers Association, Private Sector Member registered for the 2017 Annual Meeting. Wine Institute, Private Sector Member registered for the 2017 Annual Meeting. ↑ 3.0 3.1 3.2 3.3 3.4 3.5 3.6 3.7 American Legislative Exchange Council, ALEC 40th Anniversary Annual Meeting Board Meeting packet, organizational documents, August 6, 2013, released by The Guardian December 3, 2013. ↑ 14.0 14.1 14.2 14.3 American Legislative Exchange Council, 2012 SNPS Sponsors, organizational document, 2012 SNPS Agenda on file with CMD. ↑ Lisa Graves, ALECexposed: List of Corporations and Special Interests that Underwrote ALEC’s 40th Anniverary Meeting, PRWatch, August 15, 2013. ↑ Energy, Environment and Agriculture Task Force, ALEC website, Accessed May, 2011. ↑ American Legislative Exchange Council, 2014 States and Nation Policy Summit Sponsors, organizational brochure, December 3, 2014. ↑ Brendan Fischer, ALEC Struggles in Kansas City, PRWatch, May 6, 2014. This page was last edited on 19 February 2019, at 23:33.